I imagine cycles evolving in a circular motion. The concept swirls around in my head, stirring with energy. The cycles of life begin with a woman emerging out of man, in marriage. 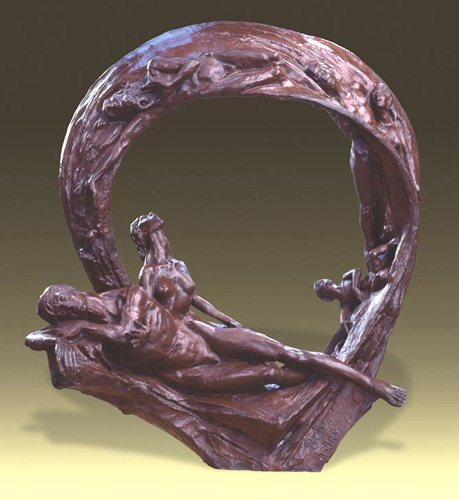 In accordance with Genesis, Eve emerges out of a rib, out of the torso of Adam as if pulled by an unseen force, implied by the open area at the center. The man and woman become one flesh. Adam parallels, not juxtapositions, Eve. Around the circular motif emerges a baby, another couple, and finally a figure representing old age, portraying three primary junctures in life, birth, marriage, and death. Adam unites with Eve and they give birth to a child who grows, marries, and ages allowing the cycle to continue. All these stages form a circle, a symbol of unity, a complete order, just as the structure of a micro atom echoes a macro solar system, yearning for its universal harmony and companionship.